Saliva is the body’s most important protection against tooth decay. Silver Amalgam Dental Fillings: The Poison in Your Teeth ... Are Your Teeth Making You Sick? A study at the University of Tennessee recently rated methyl mercury among the most dangerous poisons on Earth (second only to plutonium). Mercury poisoning is the most common heavy metal problem. Published research demonstrates that mercury is more toxic than lead, cadmium or arsenic. Even more worrisome is that mercury is a CUMULATIVE heavy metal poison. Over time it will accumulate in our bodies and can damage the central nervous system and other organs or organ systems, such as the liver or gastrointestinal tract. Mercury poisoning is the most common heavy metal problem. Curiously, the government warns that compact fluorescent lights pose a real health hazard to women and children due to their mercury content. However, they deem mercury in dental fillings and vaccines safe, which doesn't make sense. Dental fillings present a time-release poison - indeed they are the major cause of mercury poisoning in humans. Patients don't realize that the "silver" amalgam dental fillings consist of 40 to 55% mercury. No amount of exposure to mercury vapor can be considered safe - especially considering its cumulative effect. It vaporizes easily at room temperature, and in this state, is odorless, colorless and tasteless. Most medical and scientific researchers have called for a ban on the use of mercury in all products. Mercury can adversely affect the immune, urinary, cardiac, respiratory and digestive systems, and is suspected to have involvement in the development of Alzheimers disease and other neurological diseases, as well as cancer, autoimmune diseases, allergies, Candida overgrowth and multiple sclerosis. It is difficult to diagnose because the symptoms vary so much from person to person. The World Health Organization has concluded that dental fillings contribute more mercury to a person's body than all other sources of mercury combined. There is strong evidence that mercury lowers T-Cell counts - increasing cancer incidence. In fact, several studies showed mercuric chloride increased several types of tumors in rats and mice, and methyl mercury caused kidney tumors in male mice. The EPA has determined that mercuric chloride and methyl mercury are possible human carcinogens. Mercury also has an affinity for brain tissue and is implicated in brain tumors and dementia. Mercury cuts the oxygen carrying capacity of blood by half - resulting in chronic fatigue. Brain tissue has an attraction for heavy metals such as lead, mercury, cadmium, and others. When heavy metals appear in the brain they can interfere with your natural brain chemistry. This interference, overtime, can accelerate the onset of dementia or Alzheimer's. A study undertaken in Great Britain reports that the highest incidence of Multiple Sclerosis is found in Northern Ireland as well as the Scottish Island of Orkeny and Shetland. These are the areas with the highest incidence of dental cavities and dental fillings, raising more suspicion that mercury is a possible link to autoimmune dysfunction. Symptoms of CHRONIC Mercury Poisoning - The type and degree of symptoms exhibited depend upon the individual toxin, the dose, and the method and duration of exposure. Impaired immune system: Mercury reduces the number of T-cells and reduces activity in the immune system - please refer to: Is Mercury Toxicity an Autoimmune Disorder? Sensory impairment (vision, hearing, speech), disturbed sensation and a lack of coordination. 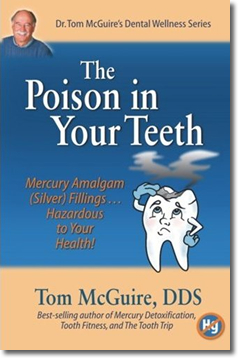 The Poison in Your Teeth: Mercury Amalgam (Silver) Fillings . . . Hazardous to Your Health!